What’s on this website? A selection of built projects from the office of STEPHEN WILLIAMS ASSOCIATES. You are invited to browse the themes, get inspired and hopefully go there and have a look for yourself. TRAVELGUIDE THROUGH SPACE, DESIGN AND DESTINATION // Spaces and buildings are better seen in reality than from illustrations. There is no substitute for “being there”! Being there is to acknowledge that you have arrived. Arrival is reaching a destination. In this Travel Guide, the various buildings, spaces or objects shown support the emotion of arriving. It is a sense of being. This is where you should be and nowhere else at that moment in time. Places that are in no way exclusive but rather accessible to all. An architecture and design that is inclusive - bringing people together at every level of interaction and understanding. The focus moves from architecture to place, from object to space, from outside to inside, from 3 dimensions to a social dimension, from people to form, from exclusivity to inclusivity. The creation of inclusive places. COMING SOON // Eat. Kiss. Drink. Restaurants, shopping, nightlife, active life, beauty & spas, automotive, home services and a lot of more categories. 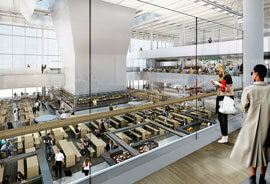 AIRPORT MUNICH // Terminal 2 satellite has now opened its doors. FACEBOOK // It is a simple, but clever action that modifies the whole working field into a playful and stimulating area. 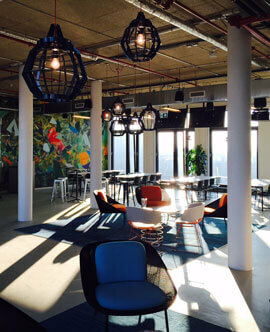 The employees can customize the walls with texts or drawings. The team sits closely together to communicate and when elsewhere have a 360° panoramic view all over the city. 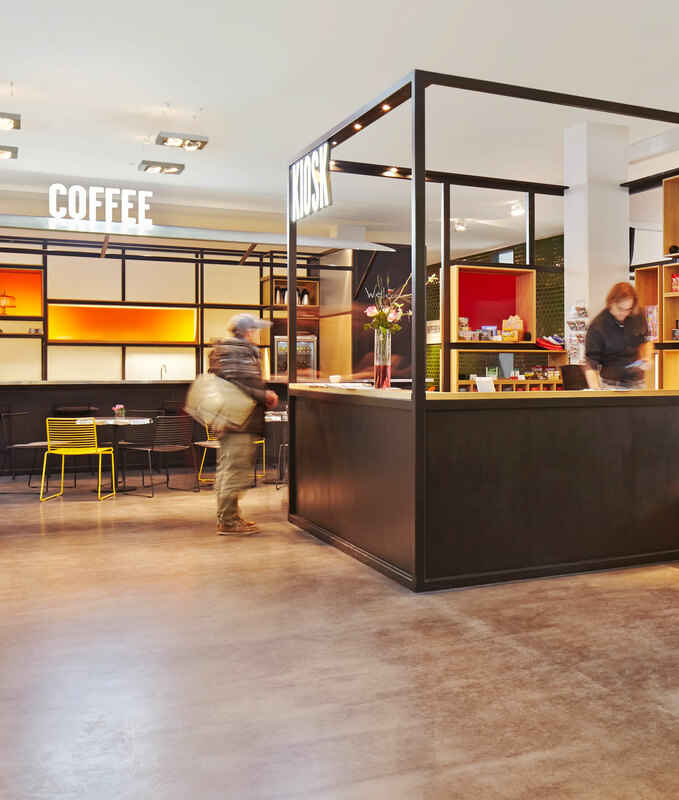 ALETTO HOTEL & HOSTEL KU-DAMM // The transformation of a previous bank building into an exciting hostel experience. 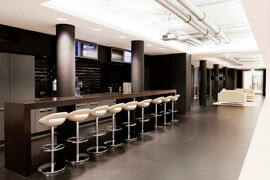 HOTEL MEININGER SALZBURG // On entering you feel like you have arrived in a theatre lobby. MOTOR MUSIC // Inspired by a motor-racing finishing flag. 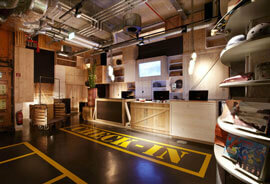 25HOURS HOTEL HAFENCITY // '24 hours is not enough' runs the claim of 25 Hours hotels. 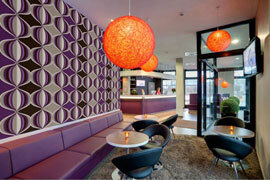 This hotel in the HafenCity is no exception. DESIGNXPORT // The centre of design. A multifunctional stage and a social hub in the tradition of import/export – A point of departure for cultural exchange and inspiration. SCHAARTOR 1 // The run-down 1960’s office building got the attention it deserved when it was refurbished in 2014. 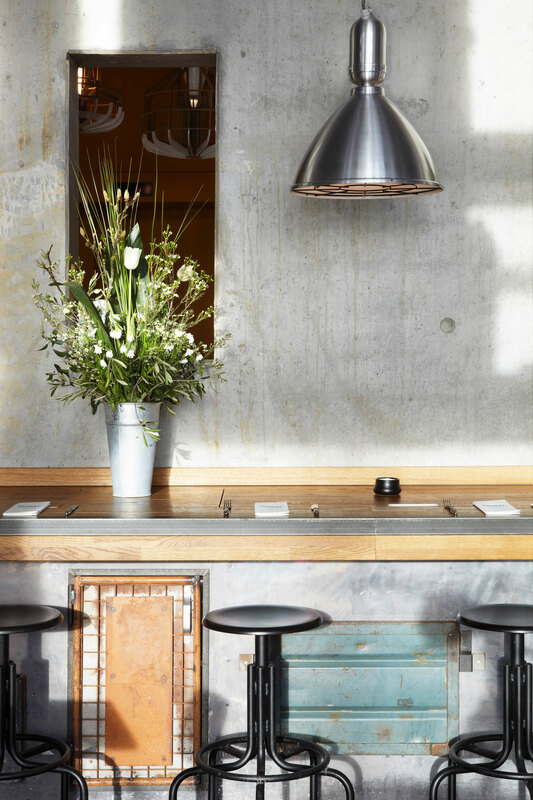 ZUM GOLDENEN HIRSCHEN // Over a golden floor, you will be welcomed by a large table – turn around and a name is revealed in silver and golden letters. SIXTYFIVE SUITES // Development of a small 1960’s office building located only one minute from the central square, with limited space and ceiling height. 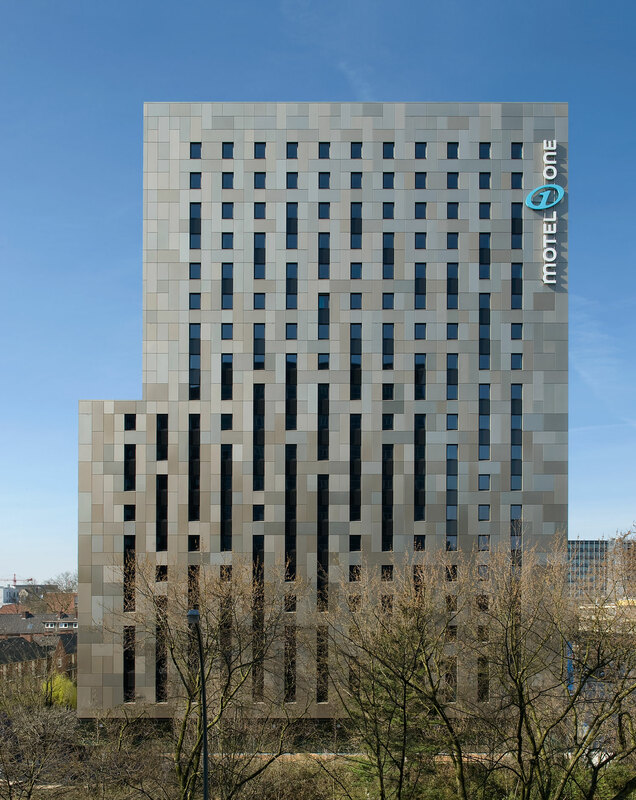 STEINDAMM MOTEL ONE // This monumental structure on a busy street is an imposing sight when you enter the city from the East. 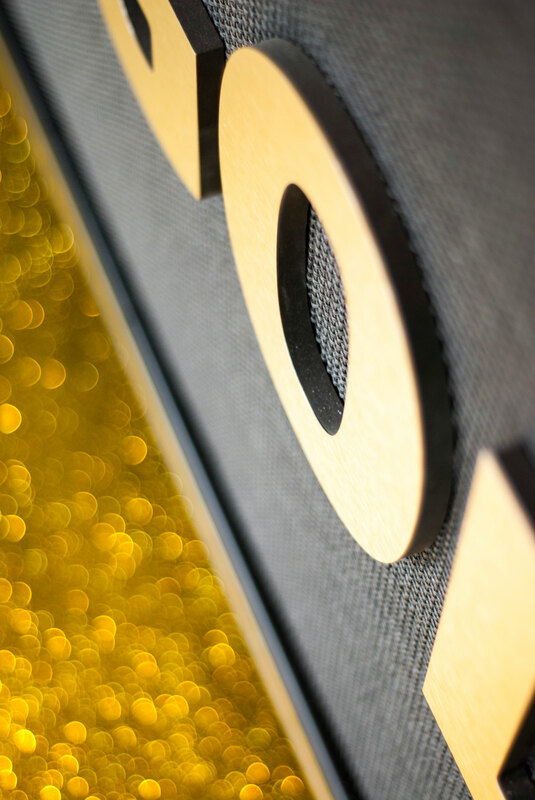 The façade panels in four gold tones reflect light in unexpected ways. 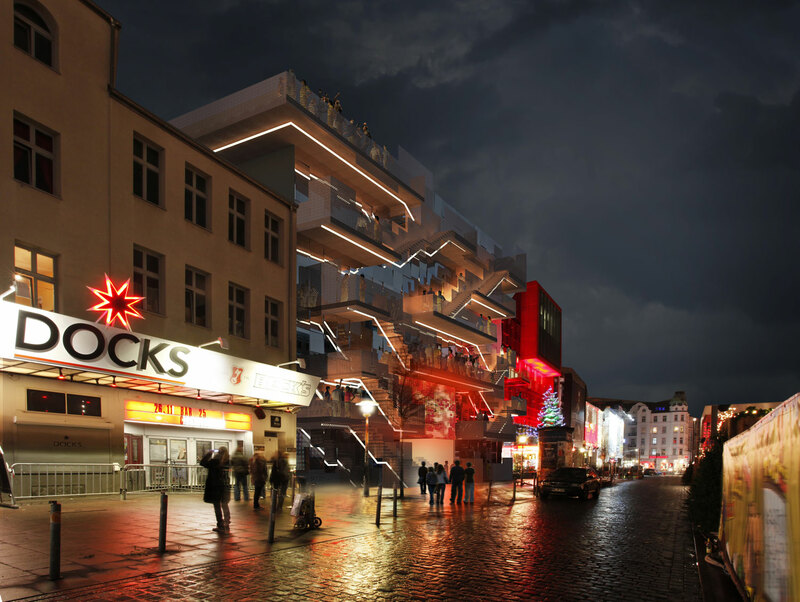 CLUBHOUSE ST. PAULI // Possibly one the most well-known streets in the world for parties, late night drinking clubs and a multitude of hedonistic activities often including a noticeable police presence. 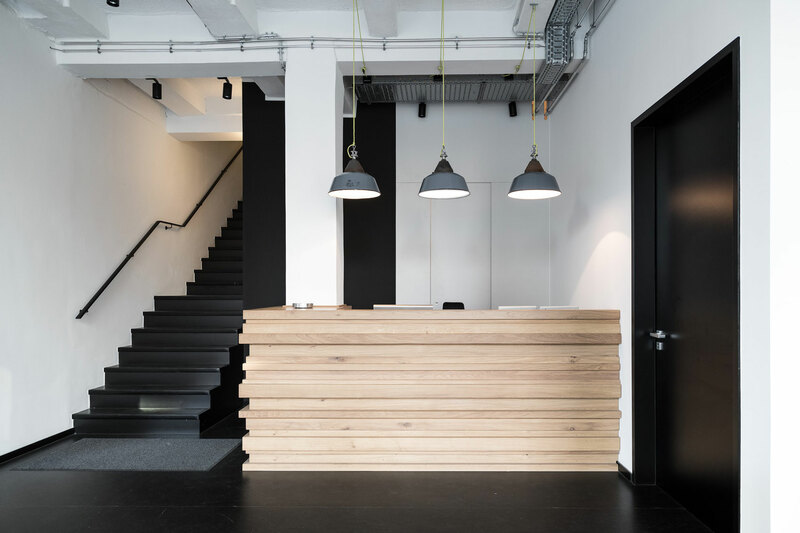 Reederei Bernhard Schulte // Right on the harbour's edge, a family-owned shipping company built their new headquarters office. JUNG VON MATT // In a 19th century factory building is where agency heavyweights Jung von Matt have their home. The timeless design reflects the agency’s character and idiosyncrasies in every detail and the use of the agencies symbol, the ’Trojan Horse’, is abstracted in many ways. 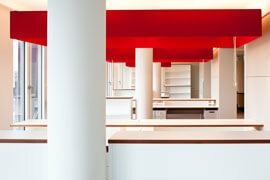 STADTHÖFE QUARTIER // Revealing spaces previously unseen for more than a century. 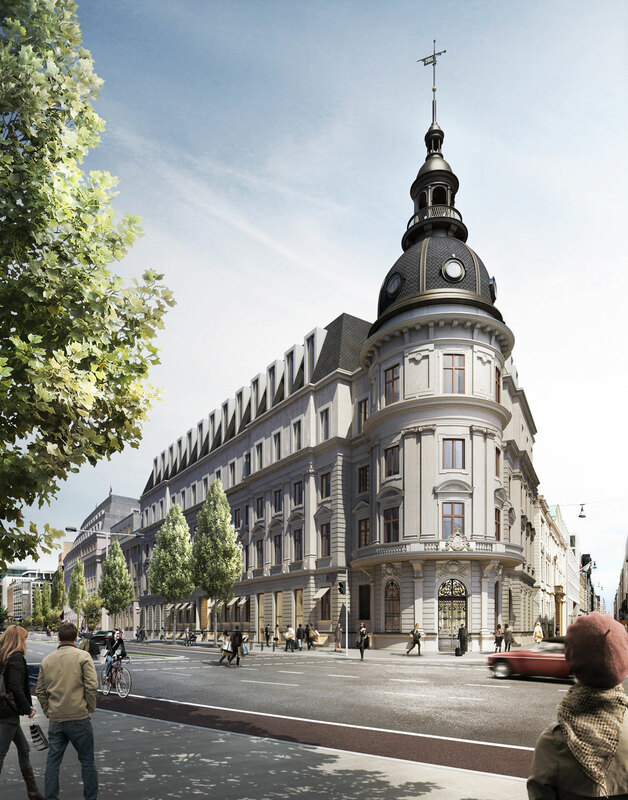 New passages, arcades and squares invite the visitor to explore a lively city quarter including restaurants, apartments, shops, offices, cultural institutions, and a hotel. 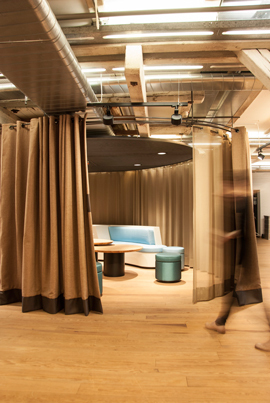 DRAFTFCB // Large floor areas allow all 200 employees to work together on one floor. 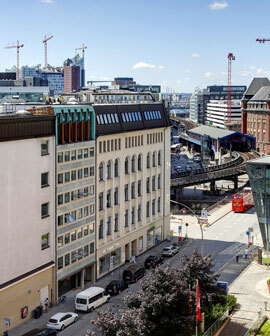 RAPP // The new working space of RAPP Hamburg adapts naturally to the urban life – as a place of activity and interaction. 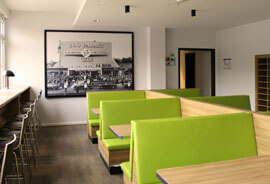 WARNER CONFERENCE AREA // A lounge with flexible furniture and fabric screens has been handmade for Warner Chappel Music. A great emphasis has been put on the quality of materials and the standard of build not often seen today. GRABARZ & PARTNER // »Grabbarz« - this word appearing like a magical person from a children’s book – is the name of the creative advertising agency. 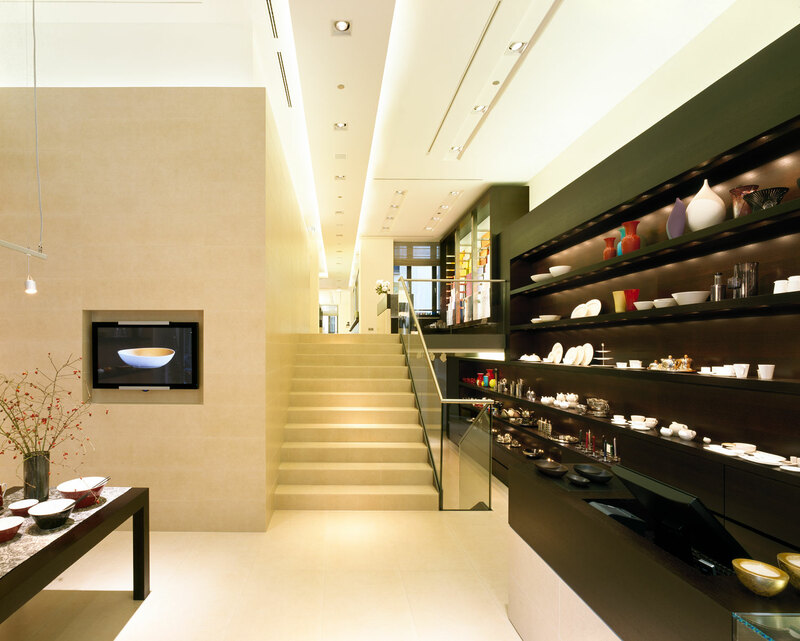 DIBBERN FLAGSHIPSTORE // The one and only flagship store of the internationally acclaimed porcelain brand ‘Dibbern’ is located in the Ludwigshof, an elegant turn of the century building in a street of individual shops such as this. Knowledge Gate // Is there intelligent life out there? If not there is always artificial intelligence here with us on earth. MEININGER HOTEL BERLIN HAUPTBAHNHOF // There couldn’t be a more central location than the Meininger Hotel Berlin directly adjacent to the main station. This flagship building of the hotel group is a market leader in budget hotels, addressing all types of travellers from business, families, backpackers as well as school classes. 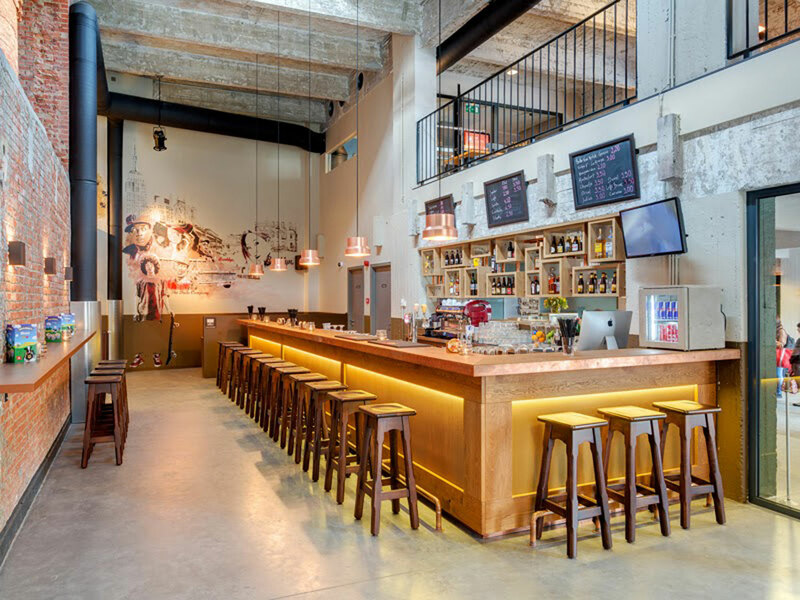 MEININGER HOTEL BRÜSSEL // In a building of the former Bellevue brewery, this Brussels hotel offers you a relaxed, but quirky atmosphere to celebrate Belgian culture: you can take a Blonde, Amber or Biére Brut in the lobby and play a little tabletop soccer or pool. You can also stroll around the hotel and run into Tintin and Snowy, as 20 artists from all over the Continent were involved in the graphics and decoration of the hotel. It reminds you, that you are in the comic book capital of Europe. GENUSSSPEICHER // A museum, tasting bar, shop and more, the location brings all sorts of tasting pleasures and peolpe together. 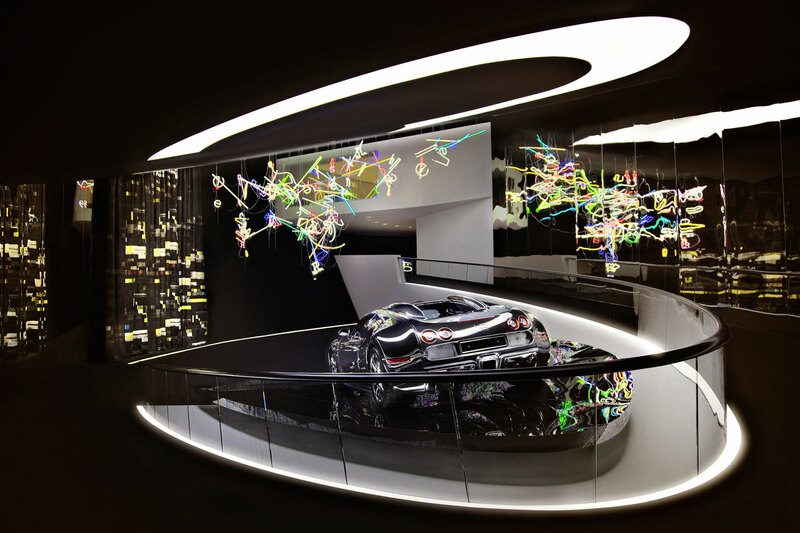 BUGATTI // The “Premium Clubhouse” is a symbiosis of art, design and architecture, which are inextricably interwoven. ART COLOGNE // An urban structure is established inside the 60,000sqm halls, a network of routes, enclosed spaces and views. 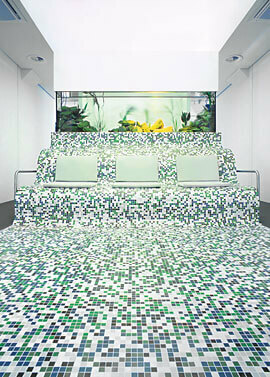 ART COLOGNE itself is transformed into an installation. MEININGER HOTEL FRANKFURT AIRPORT // The entire hotel is playfully themed “The Golden Age of Travel”, symbolising the glory years of the 1970’s. Imagine a colourful, lavish era in which every comfort and requirement is catered to. Even the rooms look like a comfortable first-class cabin - just like in previous times when flying was a pleasure. 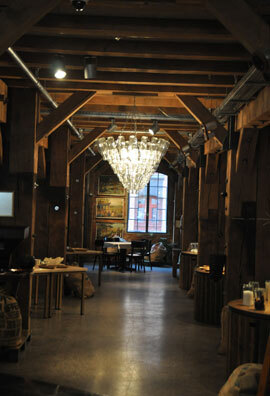 HEIMAT 25h // The restaurant is a mixture of traditional warehouse elements and modern industrial design. Many of the interior components and used materials are influenced by the nearby container port. Yellow floor graphics guide you through the space. You can even sit on your own oriental carpet pile looking out through the large windows screened by industrial storage shelves. 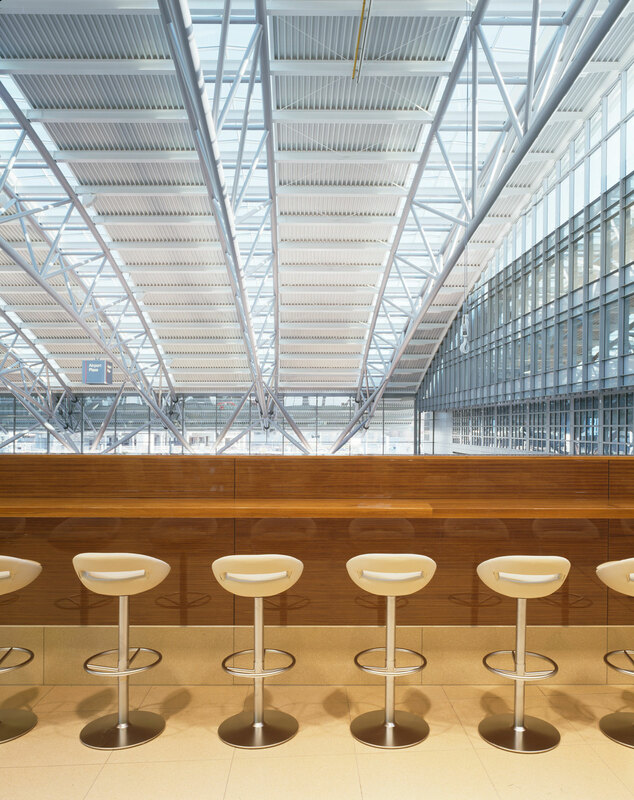 GASTRONOMY AIRPORT PLAZA HAMBURG // The design reflects the transitory existence of the building linking themes such as travel, food and location. 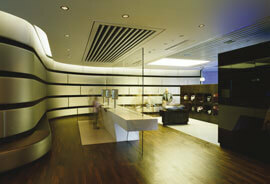 Lighting strips recessed in the ceiling resemble an aircraft vapour trail in the sky. 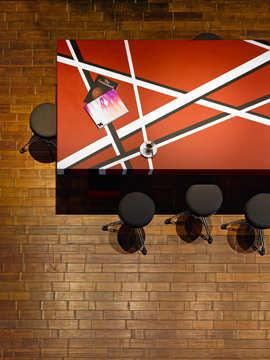 Locally inspired materials influence details such as a brick-red floor, and varnished teak wood defines the outlets identity. 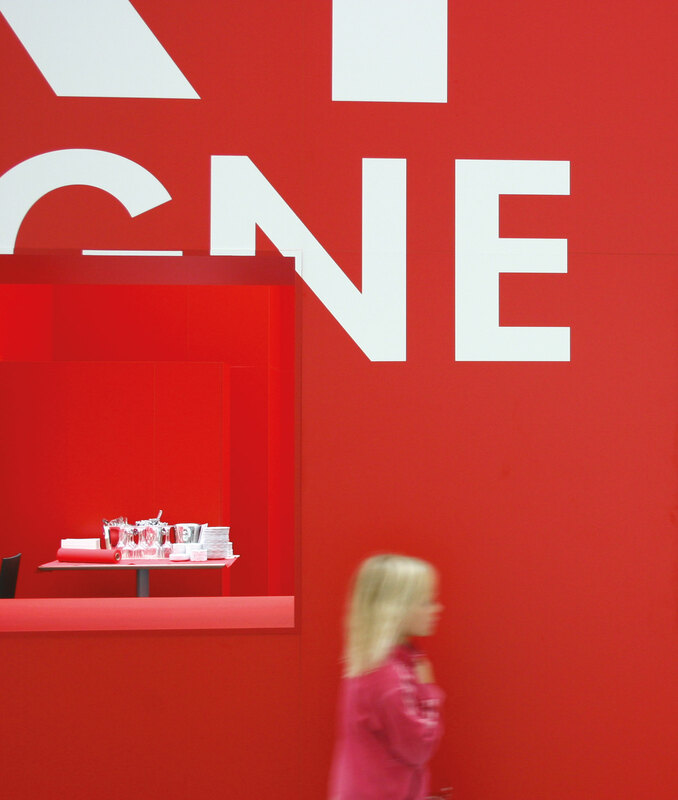 WELTBÜHNE HAMBURG // In the true European tradition of café culture as a motor of social and political change, it represents a healthy statement against the ’coffee to go’ culture. 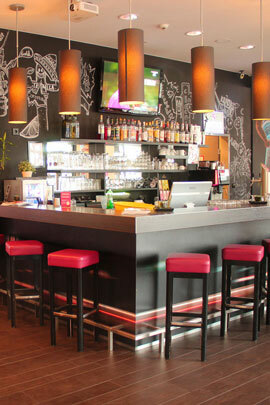 PIZZA AMANO // "Amano" means "handmade" and that’s what you get in this family restaurant in the Autostadt, Wolfsburg. 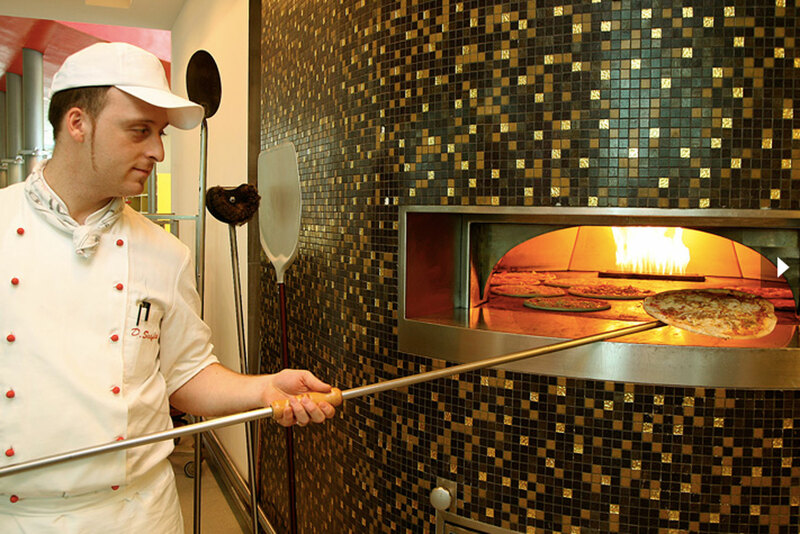 It gives children hands-on experience in making their own pizzas and a chance to experience the baking process using of a conveyor oven. The oven is a reference to the nearby Volkswagen production line. 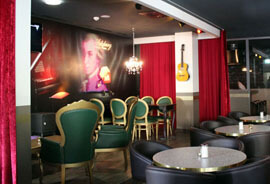 BEEFCLUB // Is this a designer steakhouse or a cocktail bar? 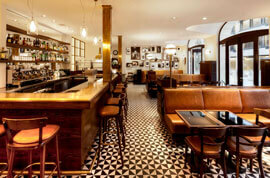 The Beefclub combines the imagery of an American diner with the elegance of a high-class European restaurant. 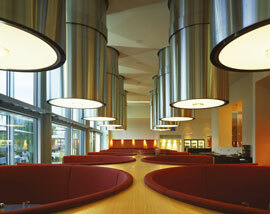 The 10 huge cylinder lamps combine an automotive aesthetic with an intimate dining experience. 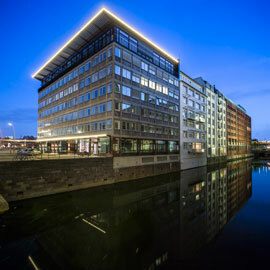 Our main office is based in Hamburg. 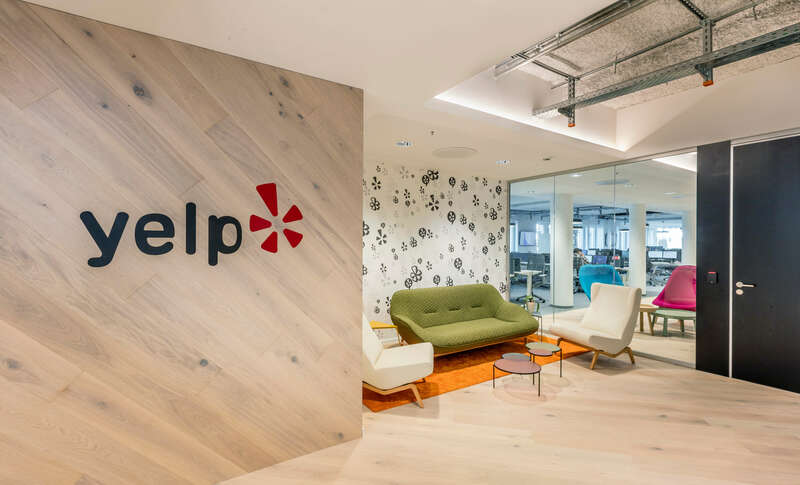 If you want to know more about our office, please visit the link above. 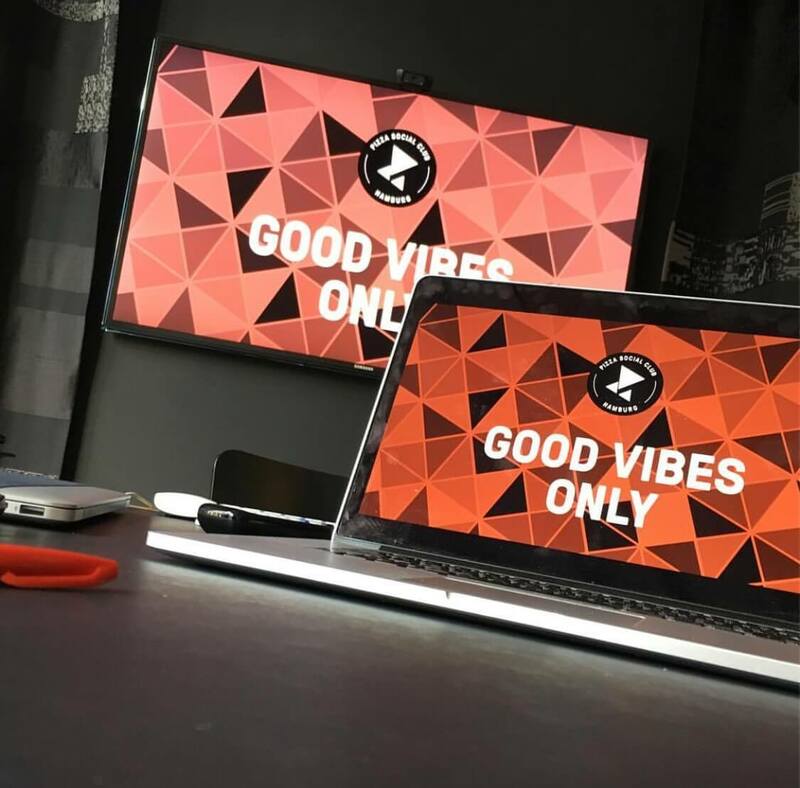 We are constantly looking for talented, enthusiastic people to join our team. Please follow the link above.